The microwave, oven and dishwasher arrived last week from Harway Appliance, but the storage drawer to be located under the microwave was MIA. Steven called Kristin at Harway. Arnold delivered the drawer today, above, set into place temporarily to check the fit. Arnold screws the storage drawer and microwave together to create a single unit. 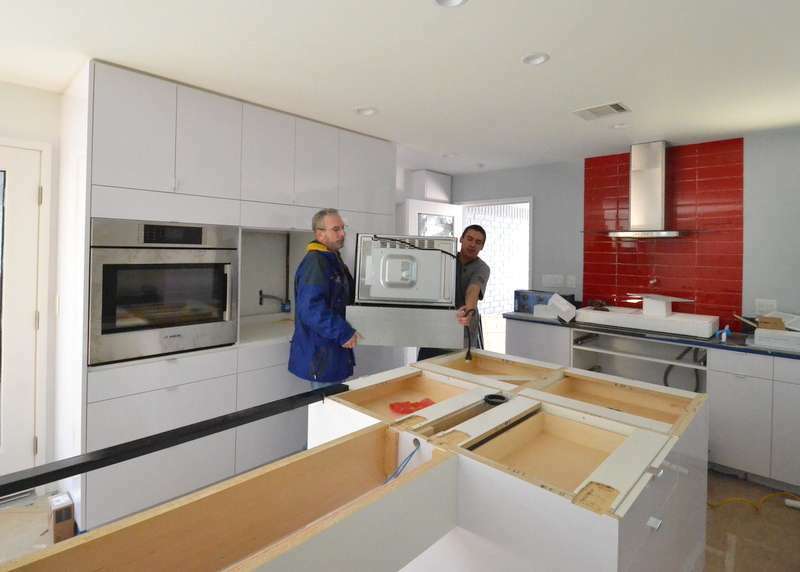 Steven, left, and Arnold, right, lift the drawer and microwave unit off the base cabinets and begin to pivot it 180 degrees, to slide into the cabinet. Ron Dahlke shot this photo using Steven’s camera. A first. 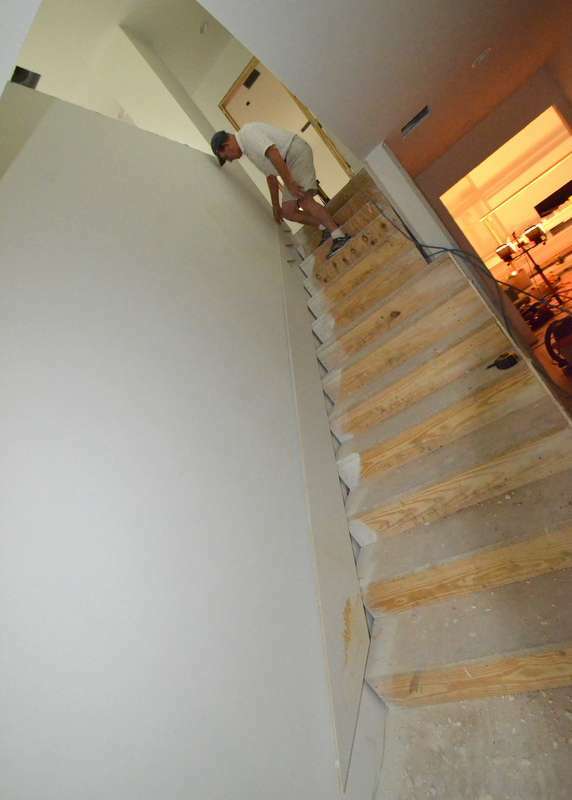 And … this is the first photographic proof in months that Steven is actually helping on this remodel, not just standing around taking pix and asking too many questions. Arnold tweaks the drawer. The alignment of the top corners where the oven, left, meets the microwave, right, was off by a visible 1/16th inch. Arnold added a shim under the drawer to lift the microwave corner just enough and into alignment. The real reason for Arnold’s visit to Emerald Hill was to take out the bow in the chimney stack of the exhaust hood. He discovered it was pushed out of perfect vertical alignment by the outlet in the wall that powers the exhaust hood. Ron is going to work on this with the electricians. Steven turned over Emerald Hill to Ron Dahlke from Ranserve while traveling all week to Vegas for ShowStoppers @ CES. Jadin and Jacquela visited the house today. Jacquela said “wow.” She and Steven plan an early visit Saturday to catch Steven up on a whole week of progress without Steven sticking his foot and hand into everything. Can’t wait. In the interim, Jadin took these photos. 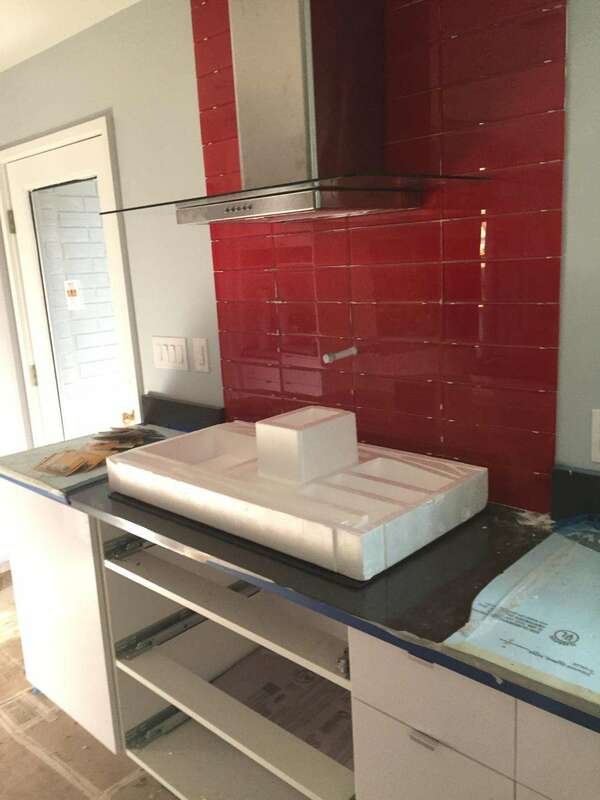 It looks like the exhaust hood is installed over the cooktop. Is the cooktop installed under the protective styrofoam? 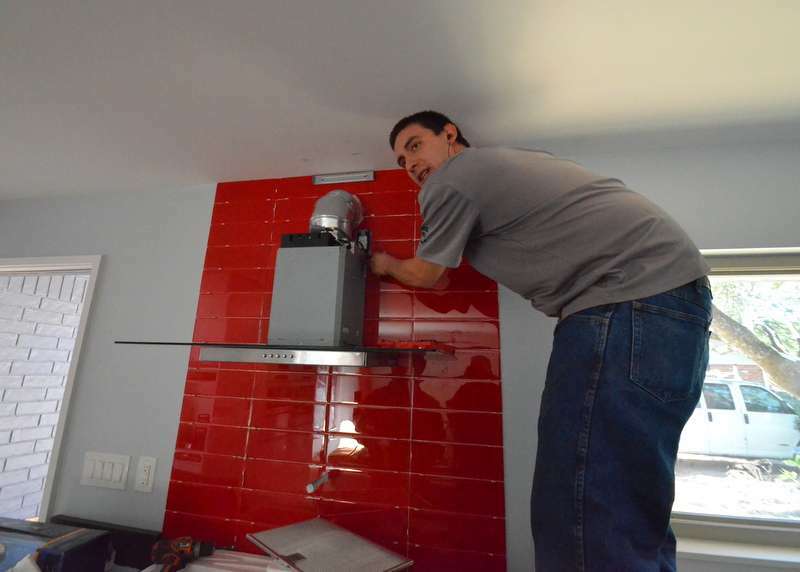 And look at that killer red backsplash. 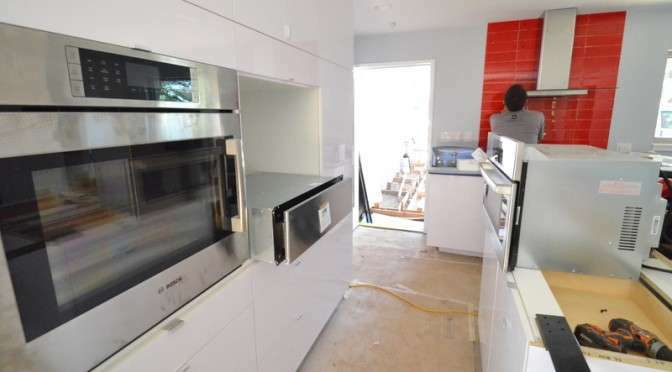 That’s the oven to the left and the microwave in the middle. Where’s the storage drawer that is supposed to go under the microwave? 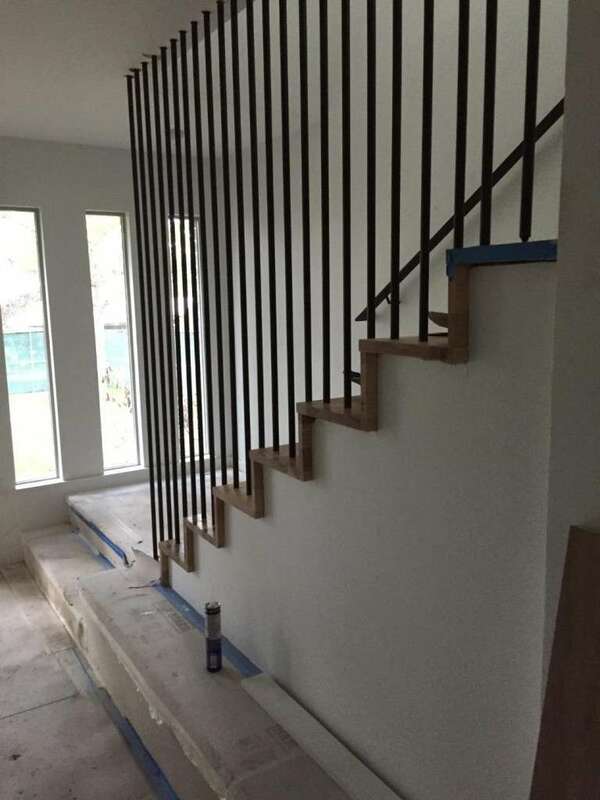 The balusters and handrailing are installed! This is the plan that Steven imagined and architect Brett drew before we started demo — made real! 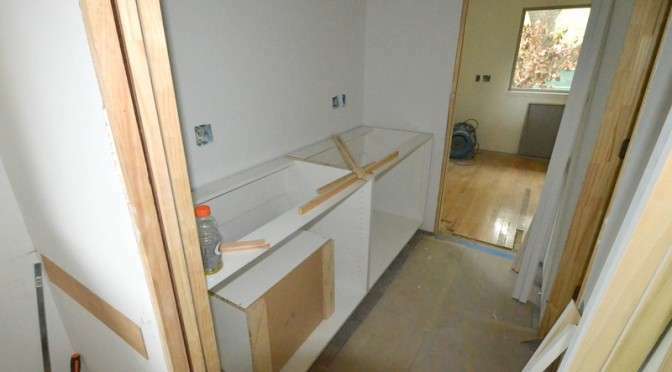 The hardest working wall in the house is in the kitchen, where the cooktop, exhaust hood, sink and dishwasher will be installed. 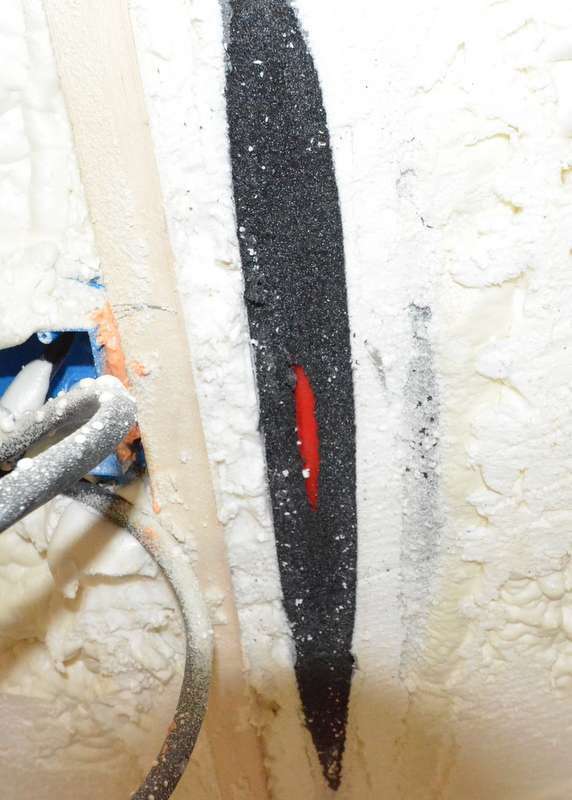 There’s a ton of blue and red PEX water lines roughed-in behind the insulation foam — and miles of electrical cable for switches, outlets, power for appliances. Plus framing structure, drains, lighting cans. The plumbers wrapped the blue and red PEX with insulating foam. 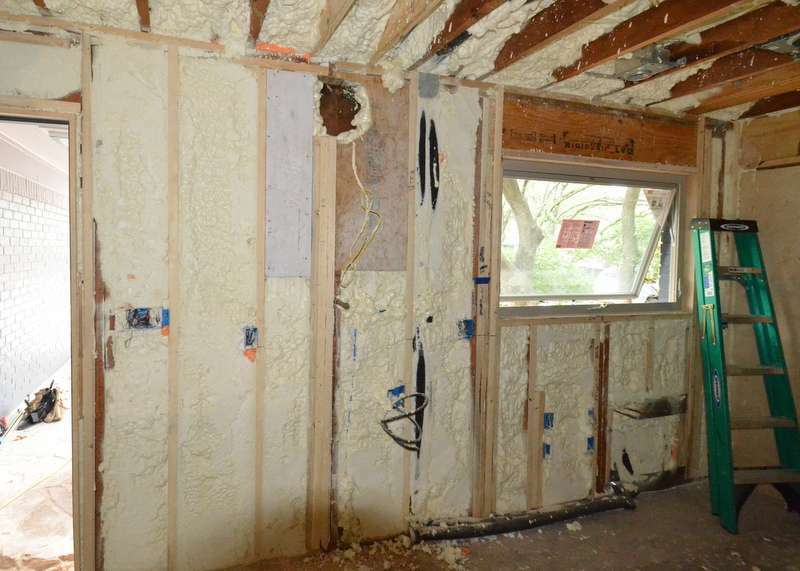 Then the foam insulation was sprayed into the stud bays. 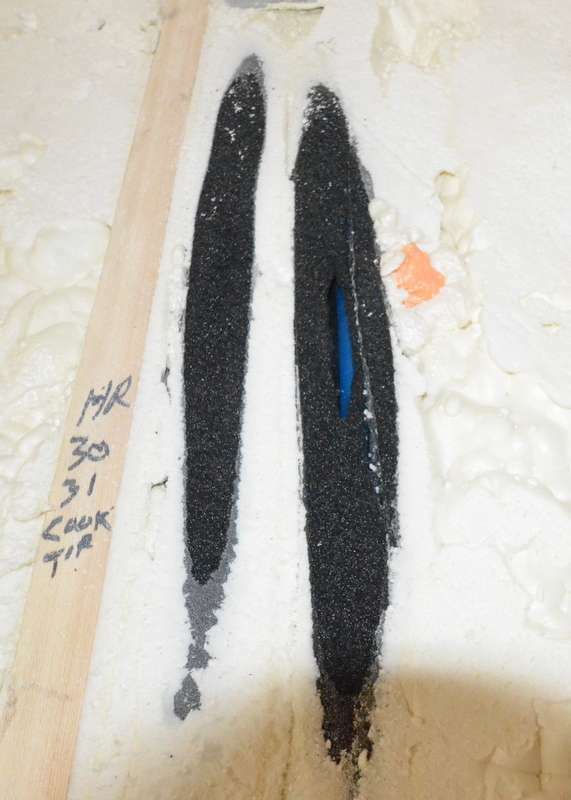 Then the insulators shaved off the extra foam that stood proud of the vertical studs — shaving off some of the black foam and exposing the PEX inside. Here’s the red PEX, for a hot water line, with dark insulation shaved and the PEX exposed. This will be reinsulated with foam from a spray can. The exhaust hood has arrived, for test fitting against the hardest working kitchen wall. 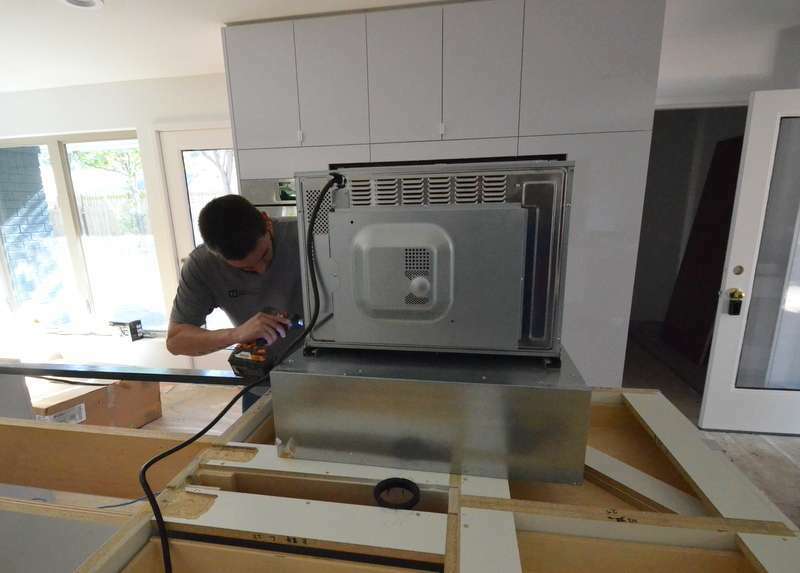 We need to know how high to mount it above the cooktop, and where to cut a hole through the wall for exhaust gases to be sucked out of the kitchen. 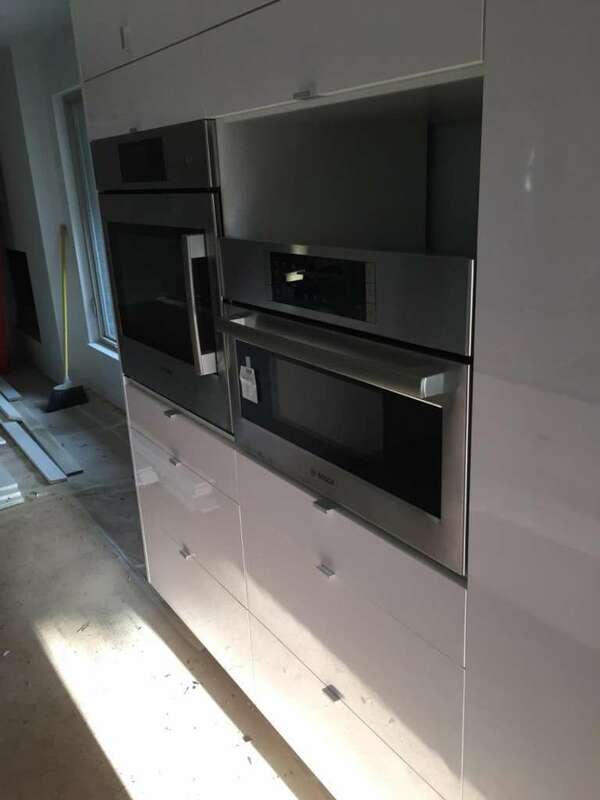 The consensus is to put the hood as high as possible, to ensure anyone standing in front of the cooktop does not lean in and whack a skull against the horizontal bottom glass. 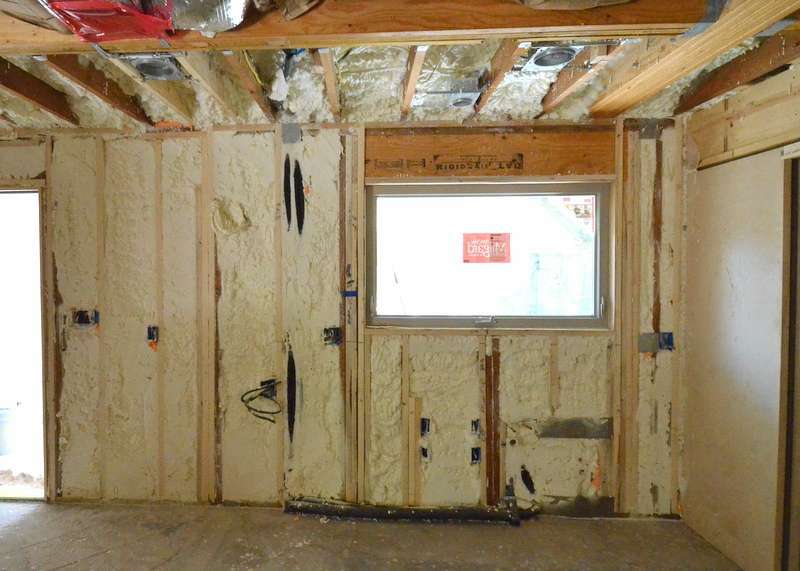 Standing back from the kitchen wall four days after the first photo above. The red PEX is protected again with foam from a spray can. 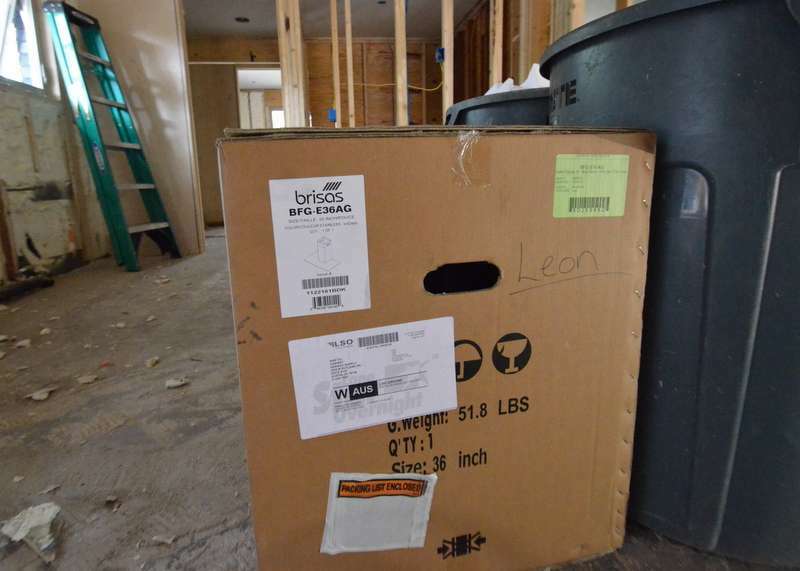 Cris from Ranserve installed sheets of plywood as blocking to mount the exhaust hood — and he began to cut the hole through the wall to eject exhaust gases out of the kitchen. 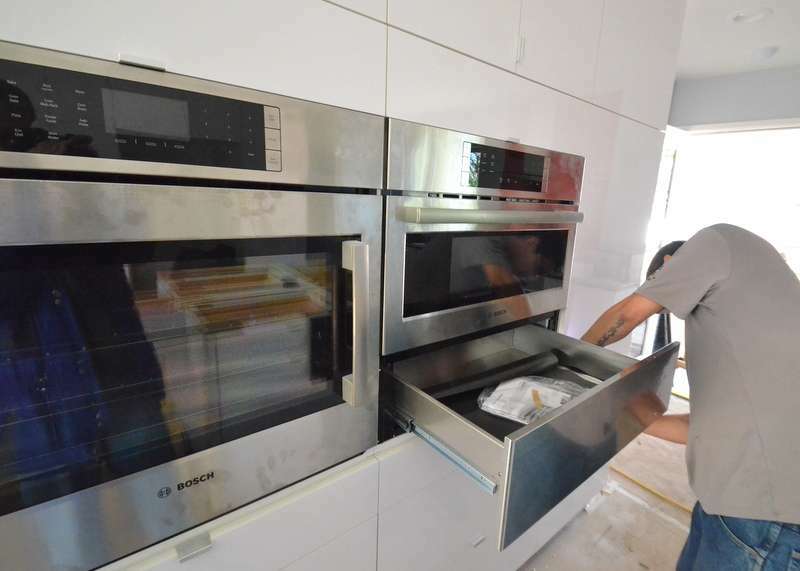 Jacquela and Steven today visited Kristin Nauert at Harway Appliances to review selections for oven, microwave, dishwasher, exhaust fan and cooktop. 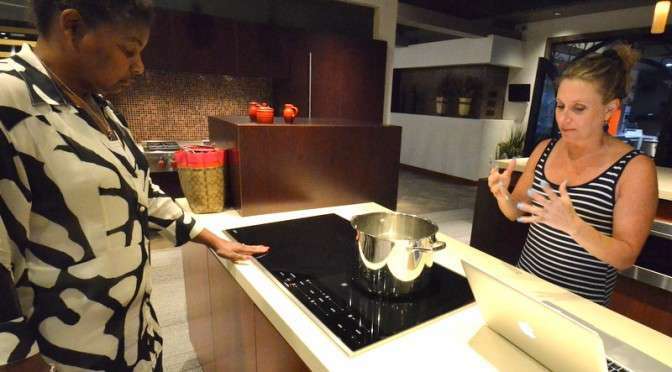 We had earlier narrowed down the induction cooktop choices to either a Wolf CI365C/B or Bosch NITP666UC. Harway now has the Wolf on display, powered, and we put it through the paces — bridging heating elements, comparing wattage against the Bosch, heating a pot of water to boil, quickly. One big difference — there are four 2100 Watt heating elements with 3000 Watt Boost on the Wolf, vs. four 2000 Watt elements with 2500 Watt Boost on the Bosch. The fifth element on the Wolf delivers 2600 Watts with 3700 Boost. The fifth element on the Bosch delivers 2200 Watts with 3400 Boost. The Wolf delivers more cooking power. The biggest difference is the control UI. It’s OSX vs. Windows. On the Bosch, you select the heating element at one set of controls, then select the temperature at a second set of controls. There is one control for each heating element, but all of the heating elements share the temperature controls — select your element at control 1, select your temperature at control 2, select your element at control 3, select your temperature back at control 2, and so on. To us, it “feels” counterintuitive and needlessly complicated. The Wolf approach is, we think, more intuitive, simpler. Each control for each element features its own temperature control. You don’t learn these things looking at specs and brochures on a web site. You _do_ learn these things taking a test drive and asking questions. Bonus points — the Wolf is $300 less expensive! And we still qualify for the “buy 3” Bosch discounts, plus rebates, on the oven, microwave, dishwasher and storage drawer.